Serve party fare or movie night treats on this handmade pine wood board featuring your zip code. Home is where the snacks are. Celebrate your special spotwhere there are always appswith this unique pine board featuring your zip code. Whitney Herndon handcrafts each, etching your digits and adding antique-inspired cast iron handles. The sturdy, food-safe surface makes a beautiful presentation for cheese, crackers, and fruits. It's a stand-out gift for new home owners or the party host with lots of love for their city. Handmade in Georgia. Wipe clean with a damp cloth. 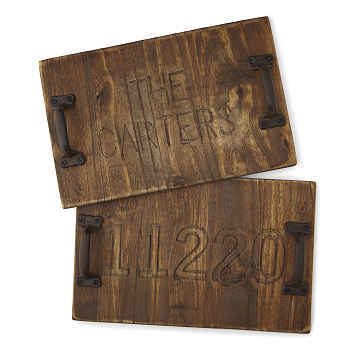 Help condition and preserve your personalized Zip Code Serving Tray with mineral oil. Great quality and a unique addition to our kitchen! My partner and I had been talking about getting a serving tray for months now (we drink a lot of tea, water, seltzer, champagne :) sometimes all at the same time) and I saw this one. It was perfectly handcrafted and just a great addition to our home. I surprised him with this for Valentine's Day and it was a hit. Would absolutely recommend!! It's a beautiful tray and a perfect wedding present!